izing or removing therefrom rancidity; second, if there is mixed any ..... .
abnormal quantities of water, milk, or cream. cream, and will therefore be classed as adulterated butter. Manufacturers of process or renovated butter shall pay fifty dollars per year. butter * as a business shall be considered to be a manufacturer thereof. tax stamp and post it as above stated. trict, but in no case less than $500. not necessitate a change in the factory number. number of coupons attached will be issued to cover the net weight. represent the contents. Larger sized packages will be similarly stamped. gross, tare, and net weight in pounds. through the collectors of internal revenue. acturer's tax thereon has been paid. I1 be made to the Secretary of Agriculture. &tbd; 'ey shall be confiscated. upper surface of the renovated butter the words "Renovated Butter"
than three-eighths of an inch square. before such marks, brands, or labels may be used by the manufacturers. ment of Agriculture at the office or place of business of the'manufacturer. S..H.:i "::. i:::.::". : ..:. :.::. . 1 .a!^^ abroad die bearing letters or characters easily recognized. 6 .i'i l iii:::,. ..
Ui; i :M: i!ii. : .. .." . : ..
may be applied to the outer box, no other sealing being, necess....!.::;":I!..!. This is the most convenient and economical method when a number .F; I!.:. samples are transmitted at one time by express. .
: : : . ; ... .......... .:: :. 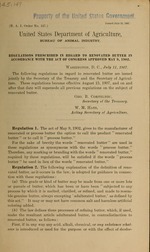 act of June 30, 1906, has reference to the classification under that act. Bureau of Animal Industry, Department of Agriculture. and after August 15, 1907. WASHINGTON, D. C., July 2, 1907.